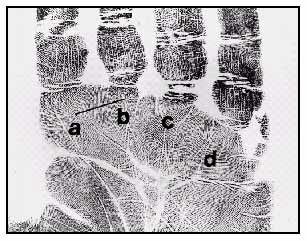 Hand Reading Mini-Course - Schizophrenia, dermatoglyphics, a-line, left-right differences & asymmetry! However, in the hands of schizophrenics the horizontal A-line is usually not accompagnied with a high axial triradius - a fundamental difference compared to the hands of people who have Down's syndrome! Figure C-2: the 'A-B ridge count' is defined as the number of dermal ridges between the 'a-triradius' and the 'b-triradius'. - And the position of the axial triradius2. In the medical sciences 'broken dermal ridges' are usually considered as a malformed condition of the dermatoglyphics. An example is presented in figure C-3. 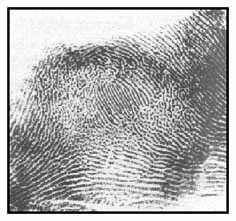 As a result of this malformed condition of the dermatoglyphics, it is hard to follow the path of the dermal ridges and frequently one can no longer distinguish the type of fingerprint pattern. 'Broken dermal ridges' are frequently observed as a feature of specific diseases; schizophrenia is one of these diseases6-7. However, sometimes 'broken dermal ridges' are observed in the hands of perfectly healthy people - this implicates that when this isolated hand feature is observed one should look for other (hand) symptoms to relate this hand feature to a disease. 1 - Markow, T.A. & Wandler, K. (1986). Fluctuating dermatoglyphic asymmetry and the genetics of liability to schizophrenia. Psychiatric Research, 19: p.323-328. 2 - Mellor, C.S. (1992). Dermatoglyphic evidence of fluctuating asymmetry in schizophrenia. British Journal of Psychiatry, 160, p.167-172. 3 - Reilly, J.L. et al. (2001). Dermatoglyphic fluctuating asymmetry and atypical handedness in schizophrenia. Schizophrenia research, 50: p.159-168. 4 - Oel, C.J. et al. (2001). Differentiating between low and high susceptibility to schizophrenia in twins: the significance of dermatoglyphic indices in relation to other determinants of brain development. Schizophrenia Research, 52: p.181-193. 5 - Bracha, H.S. et al. (1992). Second-trimester markers of fetal size in schizophrenia: A study monozygotic twins. American Journal of Psychiatry, 149: 10, October. 6 - Bagga A. Leerboek Schizofrenie: een neurologische benadering. 1991. 7 - Bracha, S. et al. (1991). Subtle signs of prenatal maldevelopment of the ectoderm in schizophrenia: a preliminary monozygotic twin study. Biol. Psychiatry, 30: p.719-725.